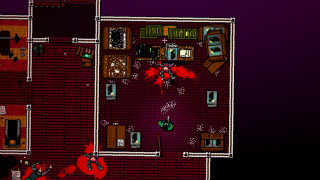 Unsurprisingly, Hotline Miami 2 doesn't look very different to the original Hotline Miami. As a result, you may not want to watch this 80 minute gameplay video in its completion, unless to enjoy the oddly discomforting ambient synth music (interspersed with chainsaw sounds, but y'know). There are a few points of interest: the new level editor is shown off at various points, while the sequel's new weapon dual-wielding is amply shown off right from the beginning. According to YouTube uploader LennyReviews , the footage is of a very early build, so level layouts may not be final. Gameplay takes place across the first two acts, during which we are promised no story spoilers. Speaking of the level editor, Samuel Roberts went hands on with the tools at E3 2014, and came away impressed. "I love what I saw of the editor, and I seriously want to try my hand at creating a Hotline Miami level that's of a professional standard, as it were," he wrote. "While Dennaton isn't looking to talk about the story of the main game, it feels like this is the component of Hotline Miami 2 that we'll be talking about for years to come.